Even the greatest film directors occasionally meet a cinematic nut they can’t crack; an ambitious tighwire walk of a project that ultimately culminates in a glorious mess of inappropriate stylistic tics, confused storytelling, and misspent good intentions. Steven Spielberg had 1941. Martin Scorsese had New York, New York. Tim Burton had Planet of the Apes. And now Peter Jackson, the visionary mastermind behind The Lord of the Rings and the flawed (but sweeping) King Kong remake, has The Lovely Bones, a perfect storm of gross artistic overindulgence and narrative carelessness. Too bad, because it’s not as if Alice Sebold’s best-selling 2002 novel, which traced, in heartstring-pulling detail, the life and untimely death of 14-year-old Susie Salmon (“Like the fish!”), was devoid of rich material. As portray ed in the film version by gifted young actress Saoirse Ronan — an Oscar-nominee for 2007’s Atonement — Susie is a sprightly, shy, and cheerful middle-child, adored by her loving middle-class parents Jack and Abigail (Mark Wahlberg and Rachel Weisz), as well as her boozy, vampy grandmother Lynn (Susan Sarandon), and hopelessly enamoured with her dreamy British classmate Ray (Reece Ritchie). As cruel fate would have it, however, shortly after her nervous first interaction with the object of her unbridled affection, Susie is lured to her doom by her creepy neighbour Mr. Harvey (a sinister and barely recognizable Stanley Tucci), a cunning sexual predator who hides behind a deceptively placid demeanour of nerdy shlubbiness. Spirited away from our earthly domain, the girl awakens in the “In-between,” a heavenly surrealistic world of lush green gardens, bobbing lighthouses, crystalline ocean, and ornately-designed gazebos, where she is able to obs erve first-hand the shattering after-effects of her grim demise upon the people she loves. While her anguished father becomes consumed with the need for closure — an obsession which causes a dreadful rift between the two Salmon parents — and Grandma Lynn is forced to take dominance over the broken household, Susie’s inquisitive older sister Lindsey (Rose McIver) begins to stir animalistic cravings within Mr. Harvey’s unhinged mind. 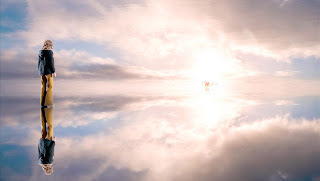 Eager for revenge against her killer and desperately yearning for her family to heal, Susie becomes stuck in limbo, unable to move onto the next stage of the afterlife until she can find solace in her present situation and leave her cherished former life behind. In its earliest stages, prior to Susie’s regrettable exit, Jackson’s direction feels confident and restrained, carefully drawing the viewer into the immaculately-recreated 197 0s-period setting and allowing us to settle comfortably into the wholly ordinary — yet ominously foreboding — daily life of the Salmon clan. He makes us genuinely care for these people, for their modest hopes and dreams, and understands exactly how to twinge our fragile human sympathies when necessary. Indeed, when Tucci’s perverted killer makes his presence fully known, casually convincing Susie to step into his underground hide-out, it’s akin to being locked in an emotional vice, unable to turn away from the unavoidable tragedy chillingly taking place on-screen. 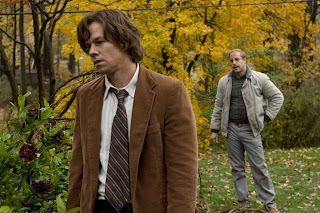 Unfortunately, it’s at this crucial point that the crippling limitations of the patchwork screenplay by Jackson, Fran Walsh, and Philippa Boyens, rear their ugly head and The Lovely Bones scatters in multiple directions at once. 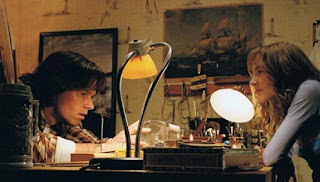 Although the sto ry is ostensibly intended to be an intimate study of a family in turmoil, the script unforgivably condenses the Salmons’ poignant journey into a superficial series of un-involving bullet-points (Weisz’ character, in particular, feels criminally short-changed) with the occasional inappropriate comedic montage tossed in to alleviate the gloom. 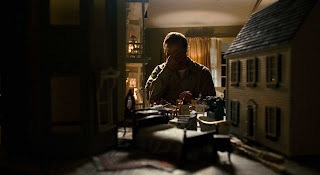 It’s perhaps a sign of the film’s borderline cynical nature that the unsavoury murderer is given a more satisfying and well-developed character arc than Susie’s mourning loved ones. 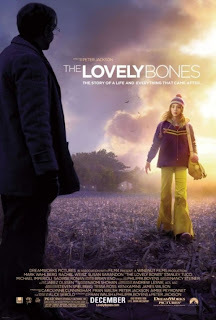 The Lovely Bones’ biggest bungle, though, is in how Jackson chooses to portray Susie’s psychedelic, prog-rock album cover-esque trip through the magical “In-between” zone. Exploiting the potential of gaudy CGI to its fullest, the director creates a fantasy-land which, more often than not, comes across like Ronan standing in front of a splashy demo-reel. These dreary segments, which constitute a large chunk of the film’s run-time, feel utterly disconnected from the rest of the work and lead to numerous jarring edits when the story bounces clumsily between its two contrasting realms. If there is an upside to this often disastrous — yet bizarrely watchable — work, it’s that Jackson’s inherent brilliance as a filmmaker does manage to make itself known from time-to-time, such as during a nail-bitingly tense house investigation sequence. Sure, these moments are q uickly overshadowed by the flick’s insufferably inept storytelling, or unintentionally hilarious bits (don’t even get me started on the inexplicably dragged-out climax involving a safe that seems to take upwards of an hour to move 10 feet), but they act as a pleasant oasis in the middle of an otherwise barren entertainment desert. 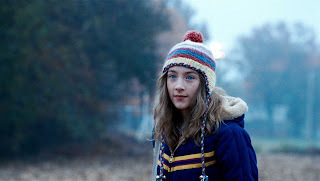 Still, for the good of Peter Jackson’s otherwise-impeccable filmography and future, I propose that The Lovely Bones be swiftly buried in a shallow grave, preferably unmarked. *Originally printed in SFU's The Peak: Jan 25th, 2010.